In general, you can visit Gardens Alive Brands Websites without telling us who you are or revealing any personal information about yourself. Our web servers track the Internet domain address from which people visit us and analyze this data for trends and statistics, but individual users will remain anonymous, unless you voluntarily tell us who you are. At Gardens Alive Brands, we want to communicate with you only if you want to hear from us. If you prefer not to receive information from us or from our Marketing Partners please let us know by calling us, by sending us an email, or by contacting us by mail at the address above. Please be sure to include your email address, full name, mailing address and specifically what information you do not want to receive. If you would like to update or correct your email address, street address or other personal information with us please contact us in the same manner described above along with the current information on our records and the information that you would like our records updated to. Please note that these requests may take up to 6-8 weeks to become effective, particularly when the changes affect postal mailings. In addition, when you purchase from us online or through our catalogs, or when you choose to enter a sweepstakes or other promotion, we may need to contact you via phone, email or physical mail to address questions or issues specific to your order, entry, etc., even if you have opted to not receive communications from us. Also note, if you delete certain information you may not be able to continue to purchase products or access other portions of our Website without entering additional information. You may request a description of the types of customer information we may share with others and a list of the entities with which we may have shared customer information in the preceding calendar year, by mailing us at the above address or by sending an email to us. We collect the e-mail addresses of those who communicate with us via e-mail, place an online order, subscribe to our email newsletter or request a catalog. The information we collect is used to improve the content of our Web page; to notify consumers about updates to our Web site, new products, special offers and seasonal gardening tips; to contact consumers for marketing purposes and to answer customer inquiries. We do not make your e-mail address available to other organizations unless you have expressly given us permission to do so. In addition, you may receive mailings from other reputable companies. 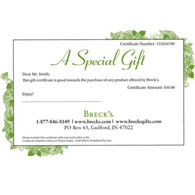 If you do not want to receive e-mail from us in the future or if you do not wish to receive mailings, please let us know by sending e-mail to us at customerservice@brecksgifts.com, or calling us at 877-846-8149. Please provide us with your exact name and address and we will be sure your name is removed from the appropriate list.